Klikněte na fotografii a zobrazte všechny dostupné fotografie k 2 Bedroom Garden Apartment near Wimbledon. 2 Bedroom Garden Apartment near Wimbledon is an accommodation situated in London, 2.2 km from The All England Lawn Tennis Club Centre Court and 4.2 km from Battersea. Guests have a private terrace. Stamford Bridge - Chelsea FC is 4.2 km from the apartment, while O2 Academy Brixton is 6 km away. 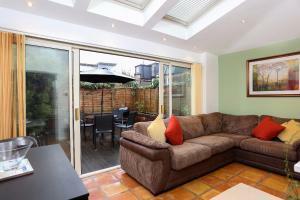 The nearest airport is London City Airport, 18 km from 2 Bedroom Garden Apartment near Wimbledon. The lead booker must be over the age of 25. The property will contact you once you have made a booking with a copy of their terms and conditions. Guests are required to return a signed copy of this agreement along with a copy of their photo identification, for guest verification within 24 hours of booking Guests are required to show a photo identification and credit card upon check-in. Please note that all Special Requests are subject to availability and additional charges may apply. Please inform 2 Bedroom Garden Apartment near Wimbledon in advance of your expected arrival time. You can use the Special Requests box when booking, or contact the property directly with the contact details provided in your confirmation. A damage deposit of GBP 150 is required when you book. This will be collected by credit card. You should be reimbursed within 7 days of check-out. Your deposit will be refunded in full via credit card, subject to an inspection of the property. Payment before arrival via bank transfer is required. The property will contact you after you book to provide instructions. In the event of an early departure, the property will charge you the full amount for your stay. This property will not accommodate hen, stag or similar parties. This property is located in a residential area and guests are asked to refrain from excessive noise.